According to a Millennial Branding study, 85 percent of college students believe that taking part in an internship is important to their future career. But according to new data, unpaid interns may not actually be reaping all the benefits they think they are. The promise with these unpaid internships is that while they won’t help students financially, they will pay them in experience, eventually leading them to job offers. In one vein, this promise is true — internships often provide students with invaluable work experience in their chosen fields. But for some students, the experience is all they will walk away with. According to a study conducted by the National Association of Colleges and Employers, there is very little difference in hiring rates between students who worked in unpaid internships versus students who had no internship at all. The results from the NACE 2013 study concluded that while 63 percent of students with paid internships went on to receive job offers, only 37 percent of those who had worked an unpaid position received offers. 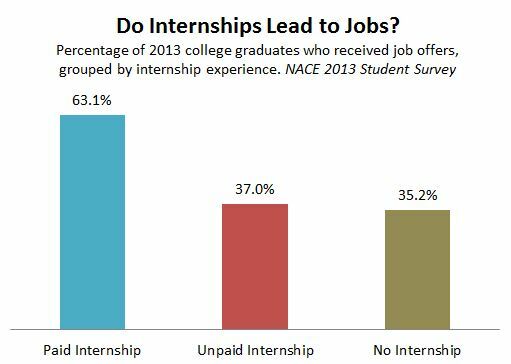 These numbers are already staggering, but it gets more shocking when compared to students who worked no internship at all: 35 percent received job offers, only two percentage points less than those with unpaid internships. Based on what NACE has to say, an unpaid internship is only slightly better than no internship at all, something that might come as a shock to students who have been told to secure this type of work experience. The problem is, internships are being misrepresented to students. While they are often necessary and positive in terms of job experience and skills, it should be brought to the student body’s consciousness that these pseudo-jobs may not actually help them secure real careers down the line. So, if the numbers are showing a false correlation between unpaid internships and post-graduate hiring rates, why are students continuing to work for free? For some majors, like IMC, an internship is a required part of study. If students cannot obtain a paid position, they have no choice but to intern for no compensation or otherwise risk not graduating from their program. Finances are another reason unpaid internships put an undue burden on college students. Not all students have the privilege of being able to devote several days a week to an internship on top of a full course load and a job that comes with an actual paycheck. Senior Daisy Perez worked as an intern for the Chicago Innocence Project, went to school full time and also held down a part-time job. She found her internship to be worthwhile, but the time commitment was a balancing act. While Perez was able to sort out her various commitments, not all students can do so as seamlessly as she did. Internships can force students to make difficult decisions: they want to do an internship and make connections that will hopefully help them in the long run, but they also face the realities of having to pay bills and tuition. Federal law requires that everyone be entitled to a minimum wage for their work. So how are companies getting around paying students in experience and letters of recommendation instead of a paycheck? There are laws in place meant to keep companies in check regarding the type of work they ask interns to do. The Supreme Court requires that internships meet six criteria to be exempt from paying the intern minimum wage. What it boils down to is that the work must be done for the intern’s benefit rather than the benefit of the company. For instance, interns cannot take the place of regular employees, as their work should be done as training for when they truly enter the workplace. Interns should be learning something valuable to their future vocation, not just getting coffee and answering phones. Even with these stipulations in place, these arrangements are still clearly more beneficial to a company than to a student. Companies have hundreds, sometimes thousands of students sending in applications to work for free, all because they believe this will help them get a job after graduation. And while it may work for some, others are spending a lot of time stressing over internships that may not be of as much value as they initially thought. I’m not arguing that we should stop interning — far from it. If students never intern or work in a professional environment during their undergraduate study, they will be ill-prepared for the business world upon graduation. Rather, I’m suggesting that students do their research when applying, and that universities make sure they are not overselling the potential benefits of the unpaid internship. Additionally, if an internship or practicum is required for graduation, schools should be providing heavy assistance to students in the process, as well as closely monitoring the internship as it unfolds. This would insure that internships are following the criteria laid out by the courts and not taking advantage of unpaid labor. Even Anderson, who felt professionally fulfilled by her work on the documentary, hopes she will not have to navigate the choppy waters of an unpaid internship next time around. “I’m hoping for some compensation when I get my next internship here in Chicago,” Anderson said. Surely, other students can agree with her sentiment. Perez, on the other hand, said she would definitely do an unpaid internship again while she’s a student. ‹ $80,000 marijuana investment goes wrong for three in Champaign, Ill.